This is just rules for animal sacrifice – disgusting but mostly boring – and then all of a sudden there’s v 23-24 – WTF? – and then back to the zzzz’s. More of the same. Is it really necessary to know what Aaron did with each internal organ, or how he spattered the blood? Or put it another way – if someone today wrote a journal like this about sacrifices, and you found it, what would you do? I’d be calling my local police station and/or mental health clinic about the author. Just sayin’. 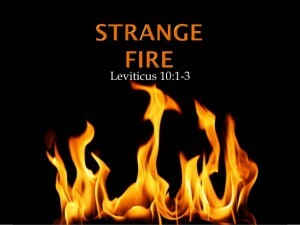 What the heck is ‘strange fire’? 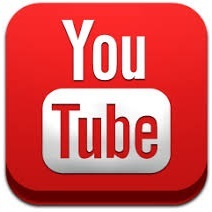 (v 1) In modern translations, it’s ‘unauthorized’ fire, or ‘the wrong kind’ of fire. Whatever it was, it cost Aaron’s sons their lives. 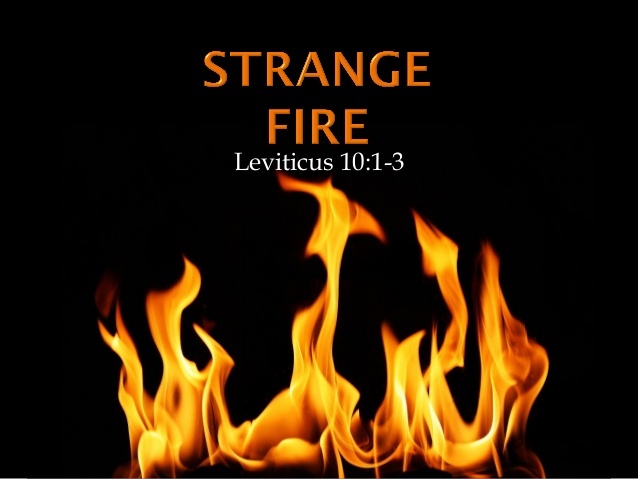 The phrase ‘strange fire’ has been used by Christians today to describe the wrong kind of worship (ie any kind that their particular denomination or sect does not approve of). It’s also the title of a book critical of the Charismatic Movement.